The location of the approved telecommunications tower at Livingston Marketplace. Photo: Ben Smith. THE City of Canning have approved construction of a telecommunications tower at Canning Vale’s largest shopping centre. Council greenlit the 28.8m high monopole tower, which will be erected on the grassed area behind the Caltex service station at Livingston Marketplace, facing onto Ranford Road. The tower, lodged on behalf of Optus and Vodafone, will be accompanied by an equipment shelter at ground level, security fencing and associated underground cabling. 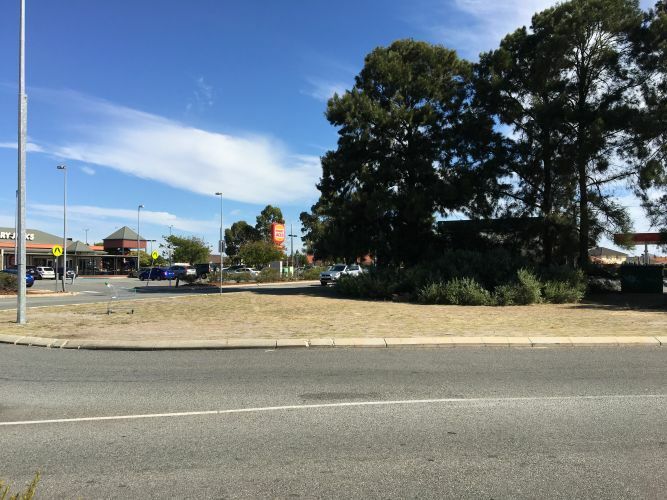 It will be located 110m from the nearest residential development on Ranford Road and approximately 180m from the nearest residential development on Nicholson Road. The council report stated the visual impact of the development would be lessened due to the large distance from residential properties and surrounding trees. The City received 21 submissions as part of their public consultation phase of the project, 15 of which did not express concerns. Concerns raised by the submissions related to the potential adverse effects from radiofrequency exposure to electromagnetic emissions, but the report stated the development would comply with Australian Communications and Media Authority radio-communications licence conditions.